Wall mounted C-Bus IR Receiver incorporating 4 stations of IR Receivers. 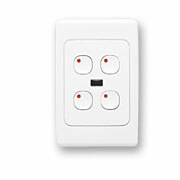 The Receiver may be programmed in the same manner as a Learn Enabled C-Bus Wall Switch to achieve functions such as a Dimmer, Timer or Toggle switch. The C-Bus IR Receivers are powered from C-Bus.